Something to look forward to: AMD is kicking off CES 2019 by announcing 2nd generation Ryzen Mobile processors, but it's not until later in the week that CEO Lisa Su will deliver her keynote address. We're not expecting full releases, but at the very least teasers and roadmap updates for Ryzen 3000 and next-gen Navi GPUs. Plenty of discussion around 7nm will take place, as well as AMD’s datacenter and mobile products. There’s also a chance AMD will announce a consumer 7nm Vega II GPU, so we’ll have to wait and see what’s in store. The first important point to note about 2nd-gen Ryzen Mobile is these are not 7nm parts. AMD will discuss 7nm developments at their CES keynote on Wednesday, but these new mobile processors are built on 12nm using the existing Zen+ architecture. They also carry Ryzen Mobile 3000 series branding, as expected. This may be a little confusing considering 3rd generation Ryzen desktop parts are expected to form the rest of the Ryzen 3000 series and should be built using 7nm, but it does fit in with AMD’s existing lines. The Ryzen Mobile 2000 series, for example, debuted ahead of 2nd-gen Ryzen, but still used the original Zen architecture on 14nm. Ryzen Mobile 3000 is a natural successor, bumping their line-up to 12nm and Zen+, around 15 months after first-gen Ryzen Mobile. Because these are Zen+ CPUs on 12nm, this is not a major upgrade over the first generation. For the most part we’re looking at 100 MHz increases to the base clock, and between 100 and 200 MHz increases to the boost clock, for the CPU cores, facilitated by the minor bump from 14nm to 12nm. There are four U-series SKUs in the line-up. At the top end we have the Ryzen 7 3700U as four core, eight thread parts clocked up to 4.0 GHz. That’s the biggest upgrade to clock speeds you will see as the 2700U topped out at 3.8 GHz. We’re also seeing an extra 100 MHz added to the clock speed of the Vega 10 GPU, now hitting 1400 MHz up from 1300 MHz across 10 compute units. Cache is listed as 6 MB of L2/L3, which likely means the split of 2 MB L2 and 4MB L3 remains. Then we have the Ryzen 5 3500U with four cores with SMT, slightly lower clock speeds on the CPU compared to the 3700U, and Vega 8 graphics at 1200 MHz. The Ryzen 3 3300U comes in with a lower boost clock on the CPU, and the GPU is cut down to Vega 6 with 6 compute units. The Ryzen 3 3200U comes in as a 2 core, 4 thread part with Vega 3 graphics. This is all reminiscent to the first-gen line-up, but with higher clock speeds. There are some new parts in the line-up though. In particular, we have two 35W H-series CPUs designed for gaming notebooks. This is an area AMD says they want to get into more and are going to be pursuing more opportunities with across 2019. First-gen Ryzen Mobile did eventually get 35W H-series SKUs but they weren’t seen in any laptops, it sounds like that will change with second-gen. Looking at AMD’s table, there is no difference to the specifications between the 35W and 15W parts, except for the TDP. So the Ryzen 7 3750H, for example, has the same core configuration, clock speeds and GPU as the Ryzen 7 3700U. However with that higher 35W TDP, the 3750H will be able to sustain much higher CPU and GPU clocks for a longer time. It is a little unusual that base clocks have dropped from the mid-3.0 GHz range down to 2.3 GHz and 2.1 GHz, but I suspect the higher TDP will still allow sustained clocks above the 3.3 and 3.2 GHz base clocks of the previous generation for CPU workloads. 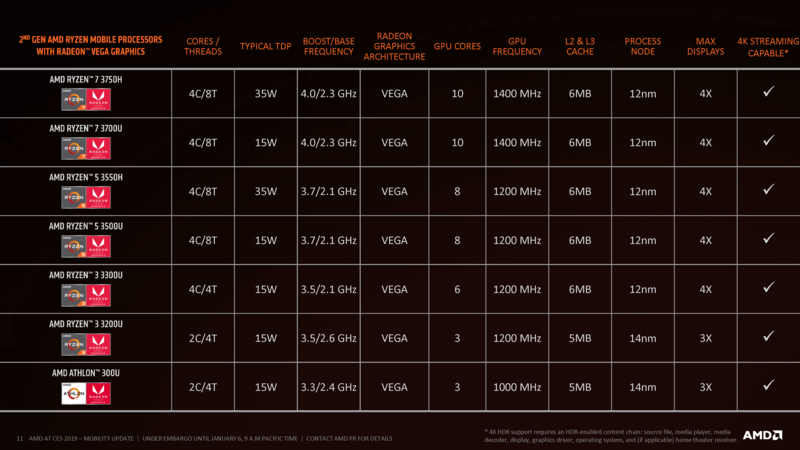 With 2nd-gen Ryzen Mobile, AMD’s H-series processors still have the challenge of going up against Intel’s 45W H-series offerings, which are currently six core, 12 thread parts with similar clock speeds. The quad-core Ryzen 7 3750H will end up more closely matched to something like Intel’s Core i5-8300H, which is commonly found in budget-focused gaming systems. 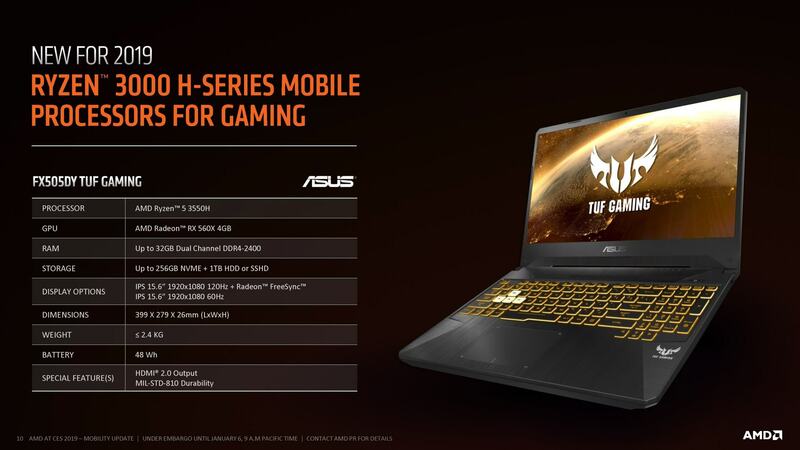 The Asus laptop AMD showed off that uses the Ryzen 7 3750H and Ryzen 5 3550H seems to be one of these budget-oriented machines as it packs a Radeon RX 560X GPU and has fairly typical entry-level gaming laptop dimensions. I think we’ll see the H-series used in similar designs across 2019. AMD has also introduced an entry-level Athlon APU into their Ryzen Mobile line-up for the first time, the Athlon 300U. This is a very similar APU to the Ryzen 3 3200U: 2 cores, 4 threads and 3 Vega compute units, but everything is clocked lower and it’s still built using 14nm. AMD says this chip is designed for the entry-level Windows and Chromebook market, where Ryzen 3 wasn’t really competing as well, so expect dirt cheap prices for that APU. All in all, nothing spectacular to see here and we likely won't see 7nm mobile parts until next year. This release is similar to Intel’s Whiskey Lake U-series with small increases over the last generation. Lots of AMD’s materials for this launch were focused on comparing 2nd-gen Ryzen to much older laptops which is a typical upgrade path for buyers. AMD did give a few vague performance metrics for some Ryzen Mobile 3000 series parts. You can see here a comparison between the Ryzen 5 3500U and the Core i5-8250U. In the next slide we have gaming data for the Ryzen 7 3700U’s integrated graphics up against Intel’s Core i7-8565U which is their latest 15W Whiskey Lake CPU. As expected, in both slides AMD’s product looks good. Perhaps the bigger announcement out of today is that proper Ryzen Mobile drivers will be available starting Q1 2019 for both first and second generation Ryzen Mobile processors. AMD says that when a new graphics driver comes out for discrete Radeon GPUs, that driver will also support all Ryzen Mobile products past and present. Users will be able to download and install this universal driver on any system that uses those products, which is great news that we had anticipated a few months ago but we're finally closer to actual execution. Poor driver support was a key issue with Ryzen Mobile products, OEMs were shipping and using outdated revisions which also lead to a buggy experience for users. Advanced users looked into solutions such as hacking desktop or APU drivers to work on their Ryzen Mobile laptops and be treated to much better performance and stability. That shouldn’t be a problem going forward and AMD has gotten their act together on this. A few loose ends... AMD is expecting 33% more design wins for Ryzen Mobile in 2019. That’s a modest improvement considering there are only a few laptops on the market that use AMD’s mobile processors at the moment. AMD also announced the A6-9220C and A4-9120C as processors specifically designed for Chromebooks. These compete with Intel’s low-end Atom chips like the Celeron N4200. These are based on AMD’s older APU designs on 28nm , but they do pack 2 cores and 2 threads at decent enough clock speeds in a 6W power envelope. These will be seen in Chromebooks from HP and Acer to begin with.